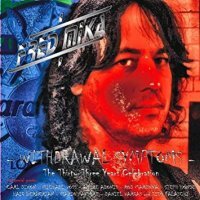 For those of you not in the know (and that included me), Fred Mika is the drummer in a band called Sunroad, and 'Withdrawal Symptoms' is sort of a cross between a solo album and a project. As the drummer and composer for most of the material, Mika enlisted a different singer for each vocal track, ranging from recognisable names such as Coney Hatch's Carl Dixon and Casanova's Michael Voss, to vocalists hailing from his native Brazil such as Rod Marenna and Tito Falashi. Mika peddles a brand of seventies-influenced Melodic Hard Rock, with the keyboard laden intro 'The Coming Of Symptoms' bringing to mind Deep Purple, with the first vocal track 'Wired In', sung by Dixon, staying in the same vein. It's a good start, and the riff of 'Artwork Nightmare', which is fronted by Voss, is also pleasing to the ear. 'Sly Side Effect' is another decent effort with Haig Berberian showing a Dio-esque vocal tone. Mika's Sunroad bandmate Andre Adonis performs the average 'Silence In Heaven', while Marenna gives his all on 'Saints Spirits Slave Sinners', but it is let down by a sloppy chorus. 'First Day' is a real left turn, going all acoustic and dreamy, but at six minutes long and with accented vocals, it outstayed its welcome by about three minutes. 'Sharppia' is an instrumental that stays in the dreamy style with a Jazz guitar solo, before it's back to Hard Rock with Hollywood Monsters vocalist Steph Honde rasping his way through 'Dawning Of Aquarius'. 'Second Skin Arena' then erupts into a ridiculous flurry of guitar notes, while Mario Pastore tries his best to be Bruce Dickinson. The album rounds things off with 'Miss Misery', which I assume is at the end of the record due to the appalling vocal from Adonis, who strains, shrieks and whines his way through a pedestrian mid-tempo stomper. With the different singers and the rather random insertion of a couple of gentle instrumentals, 'Withdrawal Symptoms' lacks any real identity, and sounds like what I suspect it is − just a collection of songs with little in common other than the drummer playing on them. Some of it is more than listenable, some of it is quite bland – as a whole, for me, I found it quite forgettable.